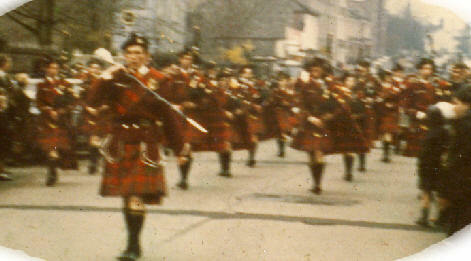 The original uniform comprised green kilts, maroon tunics with matching Balmoral tam (hat) and yellow brat (plaid) with green fringing. The uniform was completed with white shirt and yellow tie, green socks with yellow trim and black buckled shoes. This uniform was replaced in 1972. 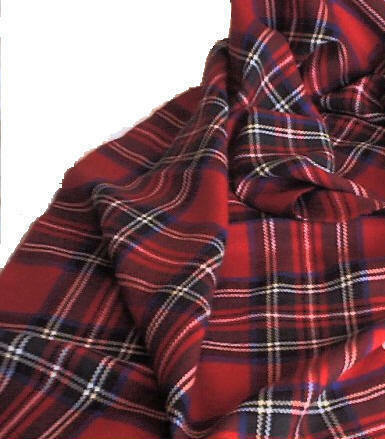 The distinctive Royal Stewart tartan kilts now worn symbolise the legacy of the retreating army of King James II (Stewart) which, following it’s defeat at the battle of the Boyne, made its final stand at the Siege of Limerick in 1691. Limerick's Pipers were heard at the battlement at famed Garryowen during the Siege of Limerick in 1691 encouraging the gallant defenders to deeds of daring and great bravery. When the Treaty was signed and the Irish Troops marched out with all the honours of war to take ship for France, Limerick's Pipers led the Brigades playing "The White Cockade". 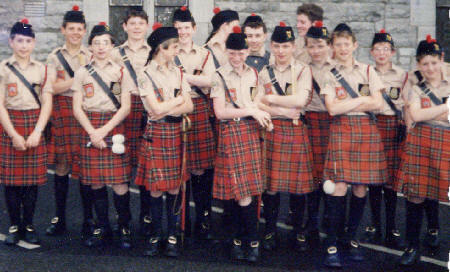 Since 1972, the uniform has undergone various subtle changes while retaining the Royal Stewart tartan kilts.